Thank you. But no, it doesn't. I'm not looking for placebo. All I want to know is from a technical standpoint if it's even possible to have any effect. That's all. It's like asking if P3D can run on Android. The answer would be "yes" or "no", right? It's that simple. In the Prepar3D Options - Display, we support VSync On and Off. You can also Enable/Disable Triple Buffering when VSync is On. These are the only options for VSync that are supported natively. Unfortunately, we cannot provide support for third party applications. Please contact the developers of any external tools for more information pertaining their products and its features. You're suggesting I contact NVIDIA and ask them if one of the options in their control panel has any effect in Prepar3D? OK, I understand. Thank you. You can try setting the frame rate limit (within Prepar3D graphics options) to half of the refresh rate of your monitor for a similar effect. For example, if you have 60hz on your monitor you can set the frame rate limit to 30, etc. Also, it appears "Nvidia inspector" is not actually made by Nvidia, so you would have to contact the proper developer, not Nvidia. The thing is if I limit the frames I get about 15-20 FPS less, which is a huge difference, actually the difference between smooth performance and stuttery mess. So I use unlimited which is the only setting that produces flyable experience when also using TrackIR. Even though it's a bit of a stretch to call the effect "similar". Somewhat "similar" would be to use 30Hz monitor. About Nvidia inspector, we already established that my question is really, and I mean really not about Nvidia inspector rather it's about if adaptive half refresh rate, which can be set via Nvidia control panel, has ANY effect on P3D at all, from the technical standpoint. Just simple yes or no would suffice. I thought the developer of the application would know that. 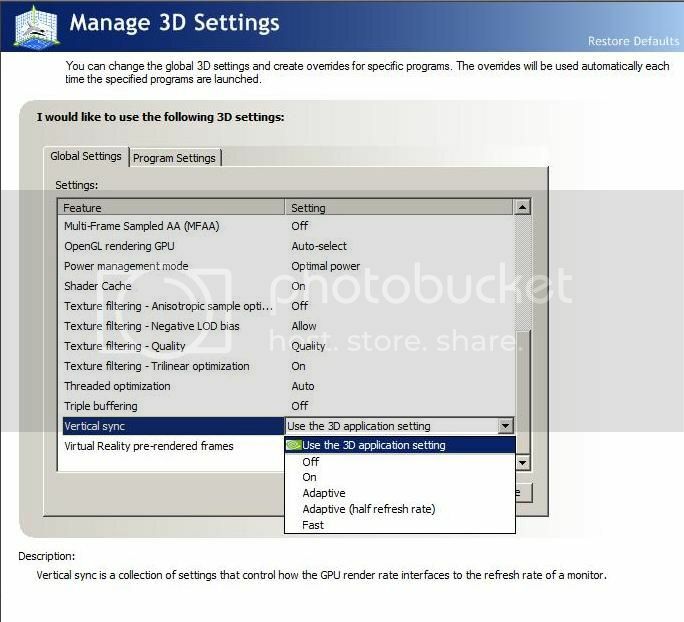 I took a look at the Nvidia Manage 3D Settings options (screenshot). The Nividia control panel has setting that Nvidia developed which the computer user is free to change (global default and profile) for many computer applications. The Vertical sync options are not specific to P3D. Nvidia site may have additional information on what each option does. I don't understand the point of that post. Nobody is asking what this option does. I know what it does, many people know what it does, apparently you don't. That was not the question. I just wanted to know if 1/2 Refresh Rate Vsync has any effect in P3D v4 because it's supposed to be a known fact that this setting has absolutely no effect in P3D v4 since the program doesn't run in a true fullscreen mode which is required for it to function. Nevertheless, topics suggesting various P3D v4 settings around the internet usually contain this adaptive Vsync setting and regularly some people swear that it does work. I just wanted to get to the bottom of this myth once and for all. As you can see, I failed miserably. Why LM refuses to give a simple answer is beyond me. I know it's not a native P3D v4 setting but for Pete's sake, they should know. It's not like I'm asking what the P3D v5 features will be :) Well, I guess this myth will live long and prosper to eternity. Over and out! If it needs true full screen to function, then it does not work. You can test it yourself by dropping all of your graphics settings so that your frame rate exceeds the 1/2 fps threshold your monitor will support. After ensuring the FPS is higher than half your monitors hz, enable the option. If it's still over 1/2, it does not work. If it's steadily at 1/2, it works. It is possible some people may have found a way to trick the option into working. It does NOT work, unfortunately. This is because P3D v4.x is not a real full screen application. FSX, on the other hand, had it work flawlessly and it really provided a smooth experience. Now, I would like to take the opportunity and ask LM developers why P3D v4.x is not a real full screen application. The only way to know what it will do on your setup is to try it. On my system it decreased performance. My response to this is it depends. It depends on so many factors due to the variety of hardware and software configurations. Well, I can't except this explanation. This is not "the feeling of smoothness" we're talking about. It's a very technical thing, a setting which either works or not. It should be down to 4 things at max... GPU, monitor, drivers and OS. I can't imagine how would any other thing have any effect on 1/2 RR Vsync. If it would actually work there shouldn't be that hard to determine what's this magic combination that makes it work. In FSX there was no doubt when 1/2 thing worked. It was the single most effective "tweak" that transformed a stuttery mess into buttery smooth simmming experience. It worked 100% of the time, no matter what combination of hardware or software one had and it was more obvious that night and day. In P3D people have "a feeling" their sim is more "smooth" when they enable this option. That's not the same! In my opinion, it's nothing more than a placebo. Nobody who claimed it works for them was able to provide any proof. Ever. Why are people then saying it doesn't work since P3D is not a true full-screen application? Why? Why it doesn't work "out of the box" as it worked in FSX? Why? I would be very happy if it would actually work. I would be even happier if someone would be able to say what combination of hardware and software they are using to make it work. It would be a miracle if LM would tell us what's the technical thing that makes it or doesn't make it work (they should know, for pete's sake, they made the application!). I'm afraid this question will stay in the realm of bigfoots and ancient aliens. Most swear it doesn't work, some claim they've seen it but the "proof" is blurry at best.